Glazed ceramic tiles are a popular option these days due their durability, water and scratch resistance. Originally tiles were hand-made, thus each was a work of art in its own right. Ceramic tile is used almost everywhere - on walls, floors, ceilings, fireplaces, in murals, and as an exterior cladding on buildings. Today of course most ceramic tiles are automatically manufactured. Ceramic tiles unlike there forebears Quarry Tiles are fully glazed, even the matt Ceramic tile is fully glazed so this means they won't need to be cleaned and sealed unless they are textured (see below) however the textured tiles can trap dirt in the groves (unless sealed) and thus will need to be cleaned out with Tile Doctor Pro-Clean and rinsed with water afterwards. Smooth and glossy Ceramic tiles will only need a light clean using Tile Doctor Neutral Cleaner, only a couple of cap fulls diluted in warm water should be required. If grout smears (also known as grout haze) are present following installation then use Tile Doctor Grout Clean-up to remove them, for situations where the haze is very stubborn then use Tile Doctor Acid Gel instead. Shower Cubicles and Wet Rooms will need a spray on product such as Tile Doctor Oxy-Pro for cleaning the tiles, we also find Duo Clean works equally well on removing mould spores and cleaning dirty grout. 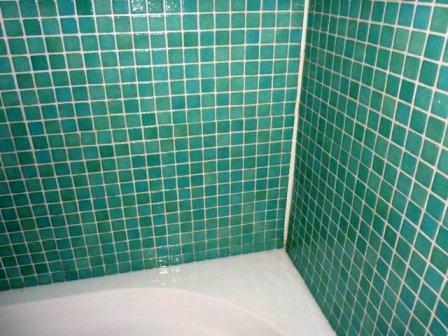 Once clean and dry we recommend sealing the grout with Tile Doctor Grout Seal and Go (see below for grout colouring). Once clean and dry we recommend sealing the grout with Tile Doctor Wall Tile and Grout Sealer which will protect the grout and make it much easier to clean in future. If the grout is the patchy after it is cleaned and before it is sealed we recommend instead of grout sealing use a Grout Colourant instead, this will restore the appearance of the grout which has lost its colour dye from heavy usage of bleaching agents. Spray on Tile Doctor Aqua Pro after showering to eliminate acid build-up from the use of soaps, shampoos and body-washes, this will not damage any sealer or grout colourant that has been applied. To remove rust stains Tile Doctor has developed Rust Away which is a gel based product unique to the market place which can be brushed or sponged onto vertical surfaces without drips forming, use as directed for best results. Most Ceramic tiles are quite easy to clean with these methods however grout is normally recessed and this can act as a dirt trap on floor tiles when they are mopped leading to a build-up of dirt on the grout, this can be resolved using Tile Doctor Pro-Clean and then once clean and fully dry, seal the grout with one coat of Tile Doctor Ultra-Seal using a pipette. Here at Tile Doctor we often get asked to recommend a sealer for Ceramic Tiles; the simple answer is they don't usually need one however textured ceramics tiles that simulate the appearance of Slate and Stone often benefit from one coat of Tile Doctor Seal and Go as this stops the dirt trapping itself into the texture of the tile. Seal and Go is however a satin finish sealer so will leave the tiles with a satin finish. 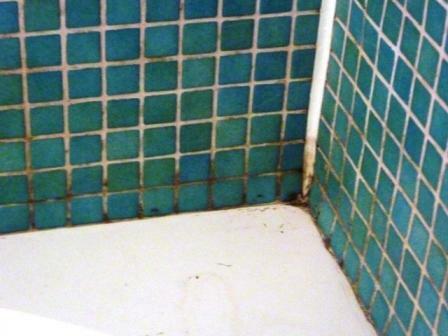 Mouldy bathroom cleaned by the Edinburgh Tile Doctor using a strong solution of Duo Clean. All-in-one Grout Colourant kit to prep, recolour and seal your grout joints. Kit contains 237ml Grout Colorant, 500ml Grout Colorant Pre-Treat Cleaner, grout brush and scrub pad. A powerful high-alkaline cleaner especially formulated for cleaning shower Tile and Grout. Highly effective cleaner that removes soap scum, body oil, mildew and algae from areas that have been neglected or subjected to frequent use.